5-week Course starts 9th Mar 2019, 1.5 hr , 11am - 12.30pm. 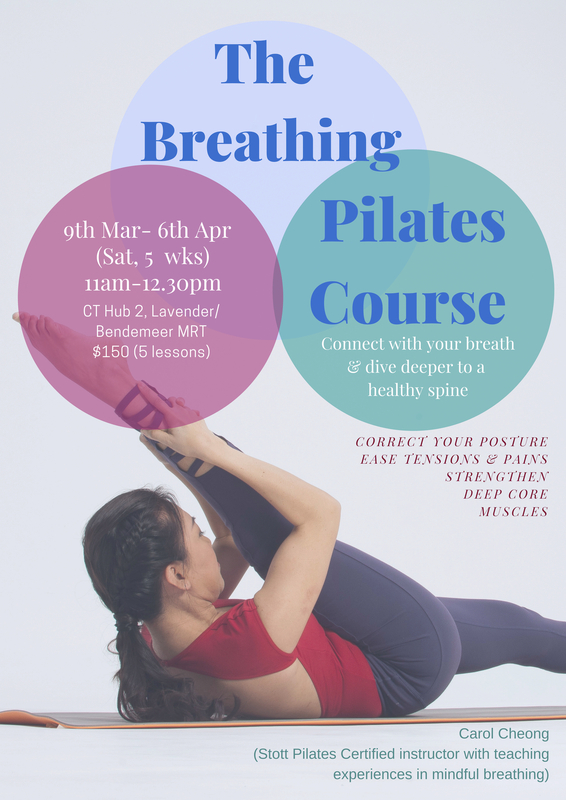 This is a mindful breathing, core strengthening, posture awareness class that follows the principles and exercises of Stott Pilates. Many beginner students or students with weak core strengths are not benefitting from the normal group pilates class because there is a lack of attention on how to breathe deeply into the lower back or sitting taller without tensing your hips and shoulders. In this workshop, we get to the root of the problem to practise pilates mindfully and effectively. class because we do not know how to activate those deep core muscles in a relaxed manner. The health of your spine is crucial in maintaining balance in your energy centers. When you can stand or sit tall, you can breathe much better and deeper which can change your mental and emotional states. This will also be a great workshop for yoga students who are pretty flexible and lack core strength. You may be able to do intermediate yoga poses with deep back bends but you experience back aches or joint pains. I had met too many yoga and dance students with this problem. Please share this with your friend. All students are required to attend the fundamental online workshop if you are an absolute beginner to Pilates Matwork, before joining the course. Please email ompulence@gmail.com for more information. Limited mat space. Max. 7 students in a class. Hope to see you. Email below to register or enquire.